As an ambitious pro drummer, you know that anything less than the ultimate sound and feel will hold you back. Introducing the Roland TD-50KVX, the flagship in our acclaimed V-Drums range, created for top-flight live performance, intense practice sessions, and eclectic studio work. Built on the foundation of the new TD-50 module with Prismatic Sound Modeling, this electronic kit provides Roland’s most impressive and wide-ranging sounds yet. The advanced processor is complemented by newly developed snare and ride pads, which feature multi-element sensor systems and high-speed digital communication with the module. The kit also includes top-line tom, crash, and hi-hat pads, and the module provides deep editing features and flexible connectivity to put you in charge. The KD-220 Bass Drum features a 22-inch wooden shell, which provides acoustic feel and big stage presence. Offering supreme playability and unmatched expression, the TD-50KVX delivers the most impactful live V-Drums experience to date. Great drummers demand great performance, and at the heart of the Roland TD-50KVX, you’ll find the TD-50—a powerful new sound module whose original Prismatic Sound Modeling technology means that every element of your playing style is caught and conveyed in thrilling detail. Working alongside the TD-50KVX’s newly developed snare and ride cymbal pads—which feature our most advanced trigger-sensing technology yet—the TD-50’s high-resolution processing gives you the most lifelike, resonant, and expressive sounds you’ll hear from an electronic kit. Cymbal choice is a serious business, and the new TD-50KVX includes some of the best. It features larger crash cymbals (CY-14C and CY-15R) than its TD-50K sister kit, and expressive players will also benefit from the new CY-18DR V-Cymbal Ride. With its regular 18-inch size and familiar motion during performance, this new digital cymbal fits seamlessly into your kit. Meanwhile, the high-resolution, multi-sensor system within the cymbal pad continuously detects every stroke from edge to bell, working alongside the TD-50 module for dynamics and response that have never before been heard from a cymbal pad. Put the CY-18DR through its paces with techniques from cymbal legato to soft bell strokes and hear the detail for yourself. You can even mute the bow with a finger touch! There’s no denying the satisfying feel and onstage presence of an old-school acoustic bass drum. If you love the feel of your acoustic kick, the KD-220 Bass Drum will feel instantly familiar. With incredible feel, thanks to Roland’s innovative air-damper mechanics which work alongside the 22-inch acoustic shell to ‘move air’ and provide resistance as the beater hits the head, the KD-220 delivers stable and accurate triggering with authentic acoustic feel. The KD-220 is compatible with single and double kick pedals**. * The product design is subject to change without notice, and may vary from the images shown here. The VH-13 hi-hat offers a two-piece structure with top and bottom cymbal pads for a natural playing feel. It also features advanced motion sensor and triggering technologies for authentic response, with smooth open-to-closed control. Just like an acoustic hi-hat, you can alter the closed tone by pressing harder on the pedal, and play foot splashes as well. The TD-50KVX is the choice for serious drummers, but there’s always room for improvement. This new kit doesn’t just let your drum technique shine; it actively improves it too, offering onboard features that help you get the best from practice sessions. Whether you lock down your timing with the Quiet Count function or play along to backing tracks via the SD card slot, it’s easy to get inspired, even when you’re practicing alone. If you play live every night, the TD-50KVX will help avoid the time and effort of a lengthy setup. The TD-50 is the first V-Drums module to feature an XLR stereo master out and eight TRS direct outs, allowing for a balanced connection to a PA system. Assigning a pad to any of the individual outputs is simple, while convenient master/headphones volume controls and group faders balance the output levels instantly. You can also assign the volume to control headphones only, perfect for adjusting the monitor level without affecting the PA signal. As a creative drummer, you’ll love the TD-50KVX’s open-ended connectivity, which lets inspiration flow in both directions. Using the module’s SD card slot, it’s easy to trigger your own WAV files using any of the TD-50KVX’s drum pads, and you can loop or layer them alongside the internal sounds while controlling volume and tone via the TD-50’s front panel. When you write a great groove, simply connect the TD-50 module to a computer via USB for multi-track recording direct to your favorite DAW. Up to 10 channels can be recorded separately, then easily edited for tone color and more. There’s even a choice of audio sampling formats: 48 kHz, 96 kHz, and the standard 44.1 kHz. 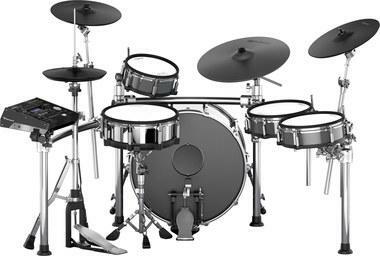 In 1997, Roland revolutionized the drumming world with the introduction of the TD-10K: the original V-Drums kit. Over the last 20 years, we've continued to develop technology that enables drummers to fulfil their creative potential. V-Drums are played by top artists on the biggest stages, and the current lineup offers a full range of solutions, from beginners to professional. Visit the V-Drums 20th anniversary page to learn how V-Drums have evolved over the years, including many internal development details never before revealed to the public.